October 16 marks the United Nations’ World Food Day, an event to focus attention on our worldwide hunger problem and ways to combat it. 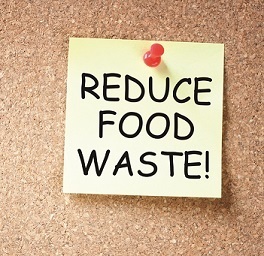 One of the most effective things you can do to help is reduce the amount of food you waste. Currently, one-third of all food produced each year – about 1.3 billion tons globally – goes to waste. That’s four times the amount of food needed to feed the 800 million people currently living in hunger. The average American wastes 400 pounds of food each year. Inventory and use what you have before you buy more. Make a plan before you go shopping and buy only what you’ll use. Be creative by using the edible parts of foods that you normally throw away (e.g. make stock for soups or sauces, sauté beet tops, make croutons from stale bread). Donate healthy and safe foods to food banks. Freeze, preserve, or can surplus fruits and vegetables. Know how much food you’re actually wasting by measuring your waste (either by weight or volume). Reduce plate size and start with smaller servings.